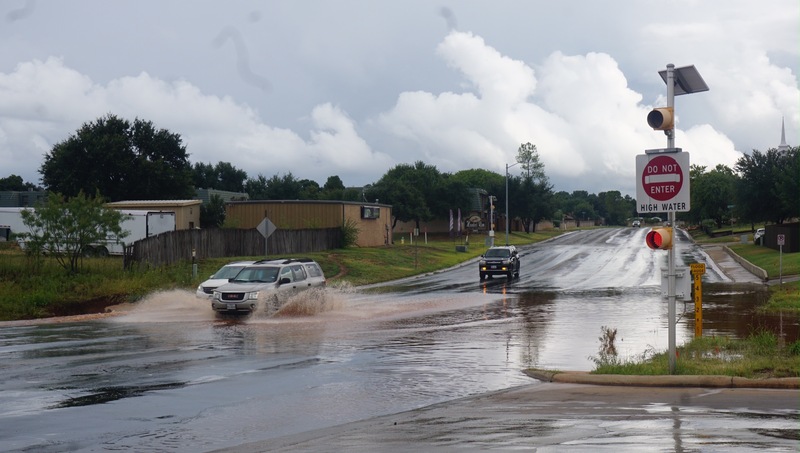 SAN ANGELO, TX -- Streets are flooding in San Angelo this Friday Morning prompting the National Weather Service office to issue an urban and small stream flood advisory for the city and a flood warning for the surrounding area. At 7:34 a.m., Doppler radar indicated moderate to heavy rain developing across San Angelo and the remainder of Central Tom Green County. Rainfall totals of around 1 inch will be possible through 9 AM. This will cause flooding of city streets and other low water crossings. Even heavier rain may move into the area later this morning. Some locations that will experience flooding include... San Angelo, Christoval, Veribest, Wall, Knickerbocker, Goodfellow Air Force Base, Grape Creek and Harriet. This includes the following low water crossings: Howard and Webster, Jackson From Knickerbocker to South Bryant, Southwest Blvd and Loop 306, College Hills and Millbrook, FM 1692 crossing Sales Branch, 1500 Block of Spaulding, 300 block of North Archer, Parkwood and Lindenwood, Sul Ross At Red Arroyo Crossing and Huntington and Sunset. Also this morning, the NWS issued a Flash Flood Warning for Western Schleicher County, western Tom Green County, Northeastern Crockett County, Eastern Irion County, and Northwestern Sutton County until 11:15 a.m.
At 7:17 a.m., Doppler radar indicated thunderstorms producing heavy rain extending from near Ozona to Mertzon to Carlsbad. Rainfall of 1 to 2 inches has already fallen...with another 1 to 3 inches possible by 11 AM. Flash flooding is expected to begin shortly. Some locations that will experience flooding include, Mertzon, Ozona, Carlsbad, Arden, Tankersley, Water Valley, Sherwood, and Grape Creek.